If you’re in the market for a robotic pool cleaner, you mean business. They are top-shelf pool cleaners, ones that spare your pool filtration system extra wear-and-tear and work fast to completely clean a pool. They’re also a lot more expensive than suction-side or pressure-side models. Dolphin’s Triton and Nautilus robotic pool cleaners are both excellent robotic pool cleaners. They can pick up sand from the floor or leaves stuck to the side of just about any kind of inground pool and can work quickly. Of the two, we like the Nautilus better for reasons starting with its price. It’s a lot less expensive than the Triton. Considering the costs of installing and maintaining an in-ground pool, the price difference is frankly not all that significant. The two are pretty equal in most other ways, and since you never want to spend money you don’t need to, so it comes down to a question of not if you are skimping on quality but that it’s just simply a much better deal. When it comes to delivering on the basics, both pool cleaners perform very well. Both are robotic pool cleaners, which themselves are top-of-the-class when it comes to pool cleaners. They can both clean up large and small debris, from sand to oak leaves. Both can also clean walls and floors equally well. Giving an edge on price isn’t always as simple as measuring the numbers on a price tag. Sometimes it’s really a matter of value, of per-dollar performance. That isn’t the case here. The Nautilus is a few hundred dollars cheaper. If you’re into your pool for a few thousand dollars already, admittedly that might not make much difference in which one you choose because you don’t want to skimp on maintenance when stakes are that high. As a matter of apples-to-apples comparison, however, the Triton’s performance just isn’t so superior to that of the Nautilus to warrant evening the tables. There are three things that give the Triton the edge here. The first is a power cord of 50 feet versus the Nautilus’ 40-foot cable. That’s something that will come in handy if you happen to have a big pool. That alone would warrant a nod to the Triton all other things being equal. It also comes with a remote control so that if it’s missing a spot that you can reroute it to complete the job. Finally, it comes with a caddy. The caddy is admittedly not really a big deal, especially considering the price difference, but it is the cherry atop the sundae. While the Triton has a better handle for easier removal from the pool, we were really moved to side with the Nautilus on its basic design by its top access that is more intuitive for most users. When it comes to the basic operation of a pool cleaner, that’s a much bigger deal than a handle that will speed removing it from the water by a couple of seconds. We also have to recognize here that the Nautilus is a little smaller and four pounds lighter than the Triton, which more than makes up for the handle. Dolphin’s Triton is one excellent pool cleaner. A robotic pool cleaner with a slimmed-down, lighter size than preceding models, it’s as good cleaning the sides of your pool as its floors. It can get your pool ready for a party in about three hours and comes with a 50-foot power cord for larger pools and a handle to slip it out of the water quickly. For added convenience, it also comes with a caddy and a remote to reroute it to hit spots it’s missed. The Triton will also cost you a lot of money, more than your average robotic pool cleaner and a lot more than the Dolphin Nautilus. 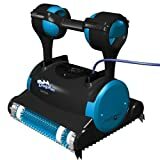 We hate to call it a budget robotic pool cleaner because even the cheapest model of those is generally superior to a pressure-side or suction-side pool cleaner. 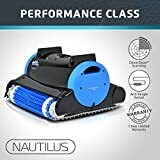 The Nautilus has a price that softens the wallop on your wallet while still delivering excellent results in cleaning the floor and sides of your pool. It does go light on the extras and has a 40-foot power cord which limits its range a little bit, but we really like the for-dollar value it brings, not just compared to the Triton but robotic pool cleaners in general. It’s also smaller than the Triton, which means that even though it doesn’t come with the Triton’s handle for easy removal it’s still not an overbearing chore to pull it out. We liked the Dolphin Nautilus over the Triton because we just felt that the standard price for the Triton was higher than what you need to pay for comparable cleaning excellence. We like the features that come with it, especially the handle to help you remove it from the water. They just didn’t warrant spending the extra couple hundred dollars to get them. Granted, the kind of money you have to put towards an inground pool makes the actual difference in price in the grand scheme not all that much, but there’s no need to spend money you don’t need to. Both robotic pool cleaners represent the best cleaners on the market, and both do a really good job. Cleaning your pool is also something you absolutely don’t want to skimp on. We just felt that with their features and performance added up, that the added expense for the Triton is probably just not worth it.